Trap-jaw ants bite with a force of over 300 times their own bodyweight, new high-speed digital images have shown. Their jaws spring shut at more than 100 km/h (62mph) - the fastest recorded speed at which an animal can move its predatory body parts. The pictures also reveal these tiny creatures, native to Central and South America, do more with their vicious jaws than simply giving a nasty nip. By biting the ground, the ants hurl themselves upwards when danger looms. 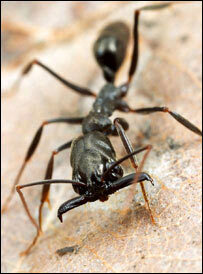 Uninvited visitors to a nest of trap-jaw ants can expect a vicious response. The ants are named after their characteristically long jaws, which they use to hurl unfamiliar neighbours from their nests, cripple prey, or deliver a brutal bite to anything they consider a threat. "This is really by far and away the fastest recorded animal limb movement," said lead researcher Sheila Patek, of the University of California, Berkeley, who worked with ants from Costa Rica. "The ants' jaws are relatively short, but they deliver such a powerful bite because they can accelerate so quickly. It's simple physics." The new findings, reported this week in the journal Proceedings of the National Academy of Sciences, also explain why the ants sometimes bounce into the air when they bite. "If they bite something which is too hard to be crushed or thrown back by their jaws, the impact tosses them upwards," said Dr Andy Suarez of the University of Illinois, a co-author in the study. This recoil effect propels the biter on to a brief, haphazard flight which ends in a crash landing several centimetres away. Such a chaotic journey might seem uncomfortable, but the ants are simply too light to be injured by their misadventures. In fact, Dr Patek and her team have now shown that the ants sometimes perform the flights voluntarily. 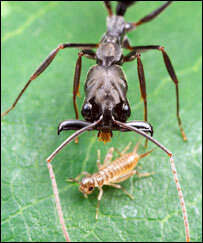 By biting the hard ground, rather than another animal, the ants can propel themselves skyward whenever the need arises. The impact throws their tiny bodies upwards. In effect, the ants are using their enormous bite force as a means to suddenly take off. This novel way to move may help them to escape predators such as lizards, which attack very quickly and would not be discouraged by a simple bite. The popcorn-effect of many ants jumping at once might also serve to confuse attackers. "The results show us the surprising and interesting ways in which a single mechanical system can be co-opted for such different behaviours," says Dr Patek.